Barbara Portailler crée des environnements immersifs faits de nos restes, traces délicates des détails d’un ordinaire auquel on ne prête pas attention et de nos déchets quotidiens. Il s’agit de réunir le public dans l’échange autour d’un ordinaire collectif, le temps d’une pause. Barbara Portailler creates immersive installations by using a delicate mixture of ordinary everyday details and pieces of daily rubbish, with the aim of provoking feelings within the audience, to highlight and recompose the collective ordinary. Her works usually requires the audience to reflect and delve deeper into its meaning in order to understand the bigger picture as it questions our daily lives on many levels – as human beings or as a society. Rencontres Photographiques du 10e. Mairie10. Paris. 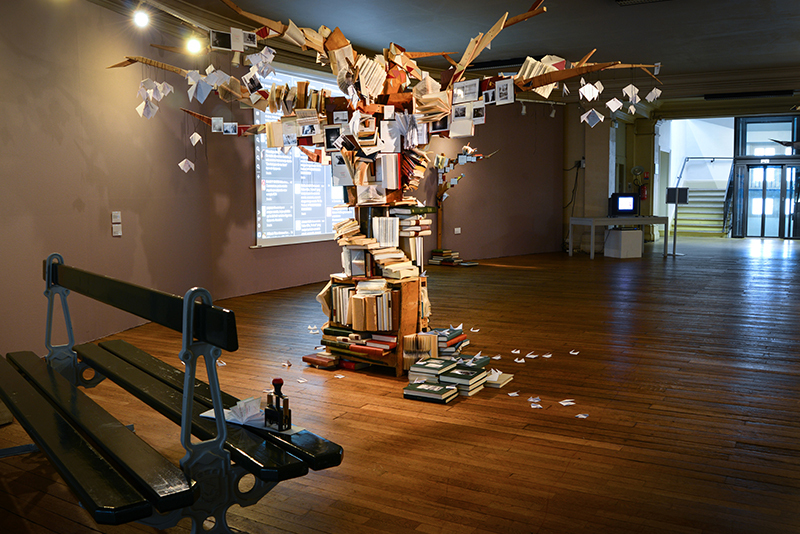 Participative installation made of used books, used furniture and photographs made by the artist. The public can activate the artwork by unfolding the leaves where one can read the following questions "What have you lost? " and uncomplete instructions in order to upcycle memories of the loss. One can choose a photo at the foot of the tree, make a self-portrait in a photo booth plunged into darkness and share its memory with the Artists. The Artist is present as a public writer, who propose to rewrite the memory of the loss . The sentence proposed by the artist appears live on the projection screen that illuminates. 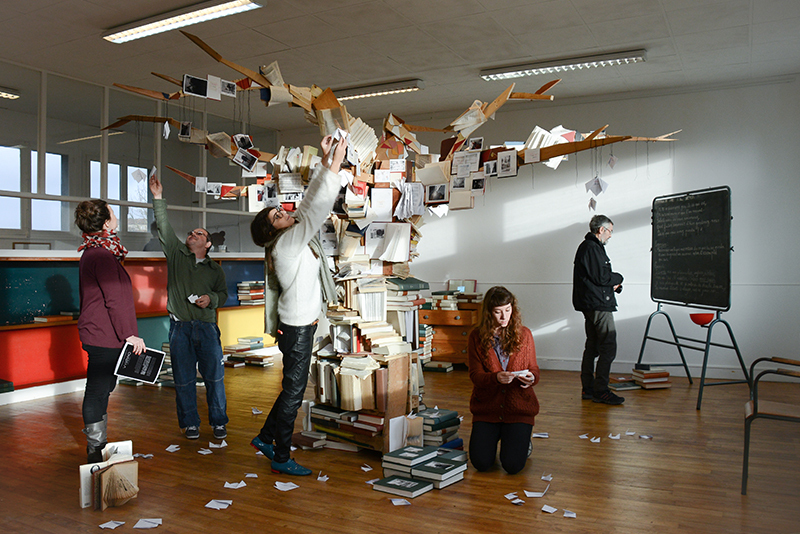 The audience receives a coupon for a new photograph of the exchanged memories that the artist will send via e-mail the day after, the week after or years after. It is a temporary work, completely recycled after use, on how memories can change via the renewal of neuronal connections, like the renewal of the leaves of a tree each year, similar but different. Le Méridien climatique. La Sorbonne. COP 21 Officiel. Paris. In situ installation made of blank post-it and used post-it notes collected in a company selling glasses and an association making brainstorming about social innovations, and sentences written by the artist on used post-its. 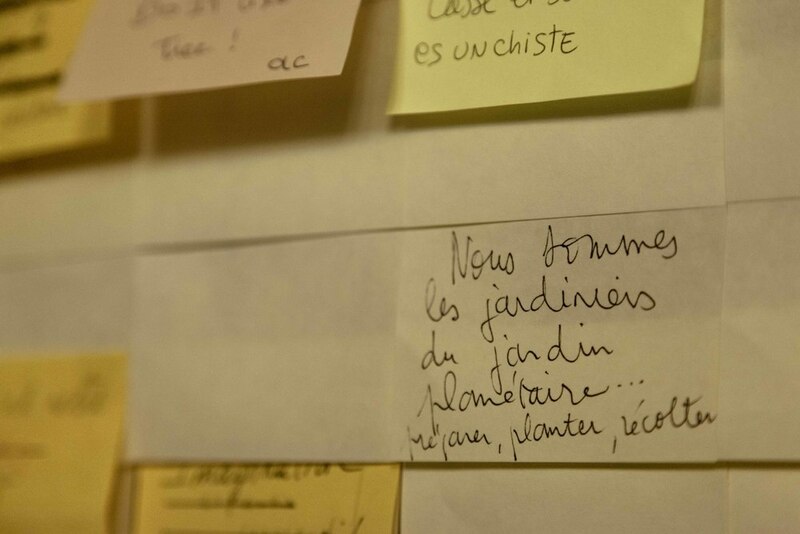 The audience spontaneously continued the gesture of the artis and wrote notes on both blank and used post-it. Aime is a video loop, made from the participatory installation of the same name, produced for World AIDS Day. The installation consists of rusty nails and the same red satin ribbon as the badge of the fight against AIDS. Participants are invited to connect the nails with ribbons, in a gesture that alternates between tension and softness, as an invitation to love against all odds.